It had been a very cold night last night but the zenkonyado had turned out to be a great place to stop. Das and I left at 7 o'clock a little bit later than planned and our first stop was the Family Mart for a bit of breakfast. A coffee and something sweet seemed to be what I wanted most each morning now. With breakfast done we started for Fujidera (#11). It was nice and chilly and slightly overcast as we headed for Fujidera (#11) but the sun was slowly beginning to make it's presence felt. I had already prayed at Fujidera (#11) yesterday but I repeated my usual prayer routine at the main hall. 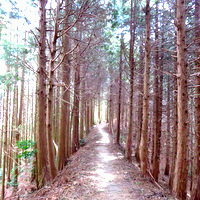 Ahead of us was one of the toughest trails, so it was for a safe journey to Shosanji (#12) that I prayed. Das and I hadn't planned on walking together but we were both booked to stay in Sudachi-kan a few kilometers on from Shosanji (#12) so I thought it would be nice to at least set out together. Das had come directly to Kamo-no-yu yesterday so while she went through her prayer routines I spent the time taking photographs. With prayers, stamps, photographs and everything done at Fujidera (#11) we both joined the trail which began immediately to the left of the main hall. It was 09:30 when we set of and it was likely that Mr Jolly and Mr No More Excuses had already left. I hoped I would catch up with them later in the day or at Shosanji (#12) itself. It had been a little overcast when we arrived at Fujidera (#11) but the sun was now out and I had a great feeling for the day ahead. It was the first proper hiking trail and it felt a lot harder than I remembered last time. It felt good walking amongst the trees and I slowly got into a gentle rhythm and kept up a steady pace just stopping occasionally for a quick break. Two hours later I came to a small rest hut which looked onto a wide view of Tokushima below. I could make out a river which I assumed was the Yoshinogawa River but it still being a little hazy it was difficult to make out anything recognizable from the past two days. It was however a really great place to take a short break before heading on. Das and I were walking apart for most of the morning but we came together again just before stopping for an extended break at Ryuusui-an. It was here that we were joined by Nobuhisa a Japanese ohenro-san who seemed to be struggling a little with what looked like quite a heavy pack. I gave him a photograph and he gave Das and I an energy bar each which was very nice of him. Having seen practically no one at all since leaving Fujidera (#11) we were then joined by a German couple. They were Beno and Susanne and both had previously lived and worked in Japan. They were now taking an extended break from their jobs in London and just travelling around. What was interesting about Beno and Susanne was that they were doing ohenro but not in the customary fashion. Neither was wearing any ohenro clothing but they were collecting the stamps. Collecting the stamps not in a regular stamp book but on the pages of a Japanese magazine which detailed information about each of the temples. There approach was different but every journey is unique and the very fact that they were planning to complete it on foot and to the end made them real pilgrims. I didn't find out too much more from them before they were on their way again. Das decided to stay put for a bit longer while Nobuhisa and I set of after Beno and Susanne. I left Nobuhisa behind me after a few sharp climbs and continued at my own steady pace. After passing the fully enclosed hut which looks like it would make for a great place to stay 30 minutes later I arrived at the foot of the long flight of steps. At the very top of the steps I could make out the giant statue of a standing Kukai in front of an equally large and impressive cedar tree. I had been looking forward to this view during my first pilgrimage after reading about an account of it on a Japanese pilgrim's website. This time there was none of the anticipation but I was looking forward nevertheless to stopping here to rest and take a few more photographs. The name of the place is Joren-an and after I had climbed the steps I set my pack down again and took another break. I decided to wait for Nobuhisa before setting of. He not only had a heavy pack but he was complaining of problems with his feet too. He turned up about 20 minutes later and I watched him struggling up the final few steps leading to the large statue. I greeted him again and asked how he was and he just nodded that he was fine. 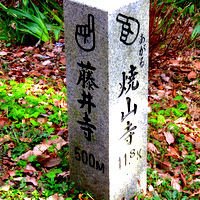 From Joren-an it was only 3km to Shosanji (#12) so I was confident he would make it. I had found out he would be staying at Sudachi-kan too so I told him I would see him at Shosanji (#12) and pressed on. A little while later I seemed to come of the mountain trail into a more open area with a few homes dotted here and there. I then came across Beno and Susanne again taking a break. I stopped too and chatted to them some more. They had not made any plans about where they were going to stay and seemed to be just going with the flow. They were not staying at Sudachi-kan but looking at my guidebook there seemed to be several places a little further on. I said my goodbyes again and continued on my way. I was then back on the mountain trail again, marked in my guidebook as henro korogashi which basically meant it was steep and and required a little care. My pace slowed markedly and I found it impossible to keep up a steady momentum. It had definitely not been this hard last time but when I finally recognised the approach to Shosanji (#12) I knew I was not too far from the main gate. When I arrived at the gate the time was just after 4 o'clock. It had taken six and a half hours to get to Shosanji (#12). There are many nice things about Shosanji (#12) not least it's location. The sun was starting to go down but the whole place was just like it was the last time I had arrived at Shosanji (#12). It was bathed in beautiful sunshine and as you make your way from the main gate towards the prayer halls you can't help but notice the huge towering cedar trees. I climbed up the steps leading to the prayer halls washed my hands and mouth and then set my pack down at a nearby bench and sat down for a well deserved rest. It had been a lot harder than I had expected and remembered but that was all forgotten because I just sat there feeling incredibly happy and unable to stop smiling to myself. I started to get myself ready to go through the prayer routine and then realised I had no more candles so I dashed back down the stairs and into the stamp office to buy some more. When I returned a man asked me where I was from and then other usual questions. The man was at the temple with his wife and he called her over and got his wife to give me a gold osamefuda. A gold coloured osamefuda usually from someone who has done pilgrimage between 50 and 99 times. The couple didn't look like they had done it that many times so I could only assume that someone else had given it to them and they were now giving it to me as osettai. It was my first such osettai and more than that, a gold or a brocaded osamefuda is considered a good luck charm. I gave my own simple plain white osamefuda in return along with a photograph. After getting my photograph snapped with the pair of them I thanked them for the gold osamefuda and got ready to pray. Before leaving for Shikoku I had given blank osamefuda to some of my friends and asked them to write out their own wishes on them. Some had also selected particular temples where they wanted me to leave their osamefuda and some had not. I decided I was going to leave prayers for my friend Shige and his baby daughter Rei and also for my running friend Mr M. I also prayed for myself, praying for the strength, courage and hope I would need, to make all the changes only I could make, to help me purse my goals after I finished the pilgrimage. I felt incredibly uplifted by the atmosphere at Shosanji (#12) and for the first time since I had started my second pilgrimage I knew exactly why I was doing it again. I felt uplifted and happy. With my prayers done, I went to the staff office to get my stamp. The young monk behind the counter carefully put the stamp into my stamp book. He could have then poured ink all over my stamp book and it wouldn't have changed how I felt at that moment. After he had finished I told him it was my second pilgrimage and that Shosanji (#12) was one of my favourite temples. I then asked him to choose a photograph he liked and after slowly looking through them he found one he liked. With everything done I headed back outside. I started wondering and worrying a little about what had happened to Nobuhisa and Das. Since we were all staying in Sudachi-kan I phoned and told the lady Uesugi-san that I had arrived at the temple but Das and Nobuhisa had yet to arrive. She suggested that they would come and pick us all up if it became necessary to do so. I thanked her and continued waiting. Das arrived about 30 minutes later, then Beno and Susanne and finally Nobuhisa. Nobuhisa looked really exhausted but he seemed a little happier after I told him that I had called ahead and that Sudachi-kan would be happy to come and pick us up if necessary. I was still in a really great mood and I encouraged Beno and Susanne to pray at the prayer halls. I gave them each 2 candles, 3 sticks of incense and 2 blank osamefuda so they could also go through some sort of routine. I had no idea whether what I was doing was right but what I was doing, I was doing with the best intention and that for me was enough. I was not sure what Beno and Susanne made of it all but I was happy that they made use of the candles, incense and osamefuda. When everyone was done praying and getting their books and magazine stamped, Nobuhisa decided he would ask Sudachi-kan to come and pick him up. Das and I were keen to walk the remaining 3km so we could pass by the statue of Emon Saburo. And Beno and Susanne although undecided about their plans didn't seem to be too fazed about the fact that they had not yet decided where to stay. Shonsanji (#12) offered shukubo so that was one option for them and if that didn't work out , there was still enough daylight to continue walking until they came to some minshuku. Das and I headed back out the main gate, turned right and following the marked trail back down again. It wasn't long before we arrived at Josan-an. This is where you find a statue of Emon Saburo and Kukai. In short Emon Saburo was one of the wealthiest men in Shikoku and the legend goes that one day a monk called at his home asking for alms. 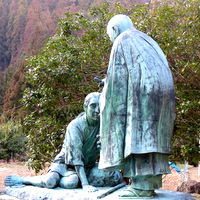 Rather than helping, it is claimed Saburo knocked the bowl from the monk's hand causing it fall and smash into pieces. Whether related or not, Saburo's eight sons all died one after the other and realizing that maybe the monk he had failed to help was Kukai himself, Saburo began searching for him in order to seek forgiveness, maybe not just for not offering alms but maybe for every selfish act he had ever done. After walking around Shikoku 20 times it is said he started walking in the opposite direction but weak, exhausted and close to death he collapsed on the path between Fujiidera	(# 11) and Shosanji	(#12). As he lay dying Kukai appeared before him and forgave him. Emon Saburo's dying wish was that he be born into a wealthy family so that he could help restore an old neglected temple in Matsuyama City. In his hand he clasped a stone and the legend continues that a little while later a child was born clasping a stone. This child grew up and was responsible for restoring the old neglected temple which later became known as Ishiteji	(#51) or literally translated 'stone hand temple'. I remembered seeing the statue during my first pilgrimage but I only learned of the significance of it when I returned home. Some say the Emon Saburo story is a little bit sinister, for me, I see in it a very positive message about recognizing the error of your ways and seeking forgiveness. With photographs taken Das and I headed on to our final destination for the day, Sudachi-kan.
During my first pilgrimage I had not stayed at Sudachi-kan. I had stopped at a zenkonyado not too far from the Emon Saburo statue. The zeknonyado was the home of someone I had referred to as the mountain monk [ link ] in my first pilgrimage story. I had planned on passing by just to say hello to him again and to give him a photograph because he really had been one of the most interesting characters I had met during maybe the whole of the first pilgrimage. He had been very honest about how he had ended up eking out a living on this mountain as a result of his own actions in the past. His advice had struck a chord because he had repeatedly said, whatever you do, do it kindly, do it earnestly and do it patiently. It was basic common sense based on his own past history and probably the most valuable advice I received during the whole of that first pilgrimage. However, time didn't seem to be on my side today. I had told Uesugi-san yesterday that I would be there about 4 o'clock and although she was now expecting Das and I to be there at 5 o'clock the pair of us were running a little late. It was almost 5:30 when we got near to Sudachi-kan and standing outside looking up in our direction I spotted Uesugi-san. I had met her during the first pilgrimage because the day after staying with the mountain monk, Takuya and I had stopped at Sudachi-kan to pick up a few supplies and Uesugi-san had served us some hot tea as osettai. She welcomed us both inside and seated us at the table where we found a much happier looking Nobuhisa, another elderly pilgrim and Uesugi-san's husband. They had been waiting for us before starting dinner and after a quick apology for our lateness we all got stuck into dinner. The food was simple and tasty and for a little while everyone seemed to eat in silence because like me the others also seemed to be in need of food energy after the tough hike up to Shosanji (#12). When I finished eating everything that been put in front of me, I pulled out all my photographs and told Uesugi-san she could choose any she liked. She picked two she really liked and while she served me an extra helping of rice I passed the photographs to the elderly pilgrim and asked him to select one too. His choice surprised me because he picked the only photograph that that was of me. The photograph was a happy reminder of how I had looked towards the end of my first pilgrimage and I had not expected people would actually choose it. With dinner over and the mood a bit lighter the next thing on the agenda was the hot spa. Before the hot spa however, we had to decide on sleeping arrangements. The building where we had just had dinner was all that I was aware of and I assumed the lodging was somewhere at the back. The lodging however turned out to be two separate buildings located about a 100m directly opposite. There were 3 men and 1 woman staying this evening and Uesugi-san asked if Das and I would be willing to share a room. Both of us had no problem with that so we were shown to a room in the smaller of the two buildings. The room had a simple bunk bed construction for two people and for me perfectly comfortable. Nobuhisa and the elderly pilgrim were put together in a room in the other larger building which seemed to be also where Uesugi-san and her husband lived. We were told to drop of our things of and return with what we would need for the hot spa and wait in from of Sudachi-kan.
After a bit of waiting for Nobuhisa, Uesugi-san's husband drove us about 20 minutes to what turned out to be really great hot spa. Driving guests back and forth seemed to be Uesugi-san husband's job and this evening he seemed a bit tired. We were all done and waiting back in the reception area at the prescribed time and soon heading back to Sudachi-kan again. Back in our room Das and I found that in our absence Uesugi-san had made our beds and in each she had placed an electric water bottle. She had also left one of those old style electric bar heaters. Das opted for the top bunk and the pair of us got on with sorting out our things and updating our notes. I also got my laundry going in the washing machine outside. Das seemed to have already nodded of by the time I finished collecting my washing and when I returned to the room, I put out the light and eased into my nice warm futon. The electric water bottle felt really great. I then continued tapping out my thoughts on my small laptop. It had been a really great day and I finally seemed to have found my own rhythm. Shosanji (#12) was a favourite temple and not only had it left me feeling really uplifted, I once again understood exactly why I had enjoyed the pilgrimage so much the first time. I was also starting to pray more earnestly for the specific changes I wanted to see take shape in my life, especially my inner life. Ever since my first pilgrimage I had realised more than ever that life itself was the best teacher and that I was constantly being taught lessons. Those that had I had heeded had helped me progress and those that I had failed to heed had led my life to remain static or even take backward steps. Although, I had tried very hard after my first pilgrimage the consequences of conscious and unconscious thoughts and actions were not going to be easily undone. The key lesson it seemed was to just keep trying my best. My main goal during this pilgrimage was now to reflect again on my own self, think about how I wanted to change and to re-energize myself. Even after just 3 days any tensions that I had felt had at all but melted away. My mind was calmer and even on just a few hours of sleep over the past few days that inner energy was beginning to surge again. I switched of my laptop and very quickly drifted of to sleep.